New SDV 1300 is a multimedia projector embedding the innovative micromirror technology in the highest (three-chip) configuration. This is a guarantee for the highest performances with respect to image quality and brightness. very high brightness of the new SDV 1300 (1300 lumen ANSI) allows to display video or computer sources on very large screens: up to 500 diagonal. Furthermore SDV1300 allows to display crisp images also in normal lighting conditions. It is the ideal product for congresses, fairs, concerts, control rooms, broadcasting studios, sport halls, schools, cinemas. new SDV 1300 is able to display on a big screen images coming from a computer with resolution up to 1280x1024 pixels (VGA, SVGA, XGA, SXGA compressed, Pc o Mac) or video sequences from a VCR, laser disk player, cameras, DVD, satellite analog and digital receivers. Six interchangeable optical groups (zoom e fixed lenses) allow to fit the projector both in small and in big room with flexibility with respect to the display size. 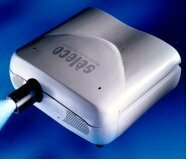 new SDV 1300 is really a Plug&Play projector; no complex adjustments and settings; it can be easily installed in a few minutes. Big handles allow a safe and reliable handling. Focus and vertical shift are possible by a simple pressure of a button on the remote control. Remote control: Both infrared and cable backlighted RC with shortcut buttons to main functions; a simplified user remote control is provided on top.